Shop4teams is your #1 source for custom volleyball uniforms and the customized volleyball apparel your team needs to stand out from the competition. When your volleyball team takes to the court, no matter how important the game is, you want them to look their very best. You want them to feel like champions, so let them. 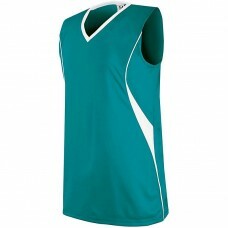 Give them incredible adult stock volleyball jerseys that embody their competitive essence. No matter how many teams show up to the tournament, you will always notice the uniforms from Shop4teams. Our work stands out. Our customized volleyball uniforms are worn by teams all across the country, because teams that want the best know they must come to the best. Size chart 100% Polyester Micro Interlock fabric features Essortex Wicking and Mechanical Stre.. Size chart 100% polyester with Essortex moisture management performance; Contrast shoulder panels; C.. Size chart 100% Polyester Essortex wicking fabric * Comfortable 2 piece contrast color collar.. Size chart 100% polyester with Essortex moisture management performance fabric * V-neck colla.. Size chart 100% polyester wicking smooth knit * 90% polyester/8% spandex wicking pinhole mesh.. Size chart 100% Polyester. Sublimated stripe front body. Micro mesh back panel for extra breathabili.. Size chart 100% polyester with Essortex moisture management performance * Sewn-in contrast pan.. Size chart Lightweight 90% polyester/10% spandex knit * 92% polyester/8% spandex wicking pinho.. Size chart Dry-Excel™ Micro-Interlock, polyester knit with wicking and odor resistant properti.. Size chart Dry-Excel™ Micro-Interlock, a polyester knit with wicking and odor resistant prop.. Size chart 100% Polyester moisture management/antimicrobial performance fabric Self fabric collar Ba.. Size chart 100% Polyester moisture management/antimicrobial performance fabric Contrast side & s.. Size chart 100% moisture management/antimicrobial performance fabric Front and back contrast inserts..